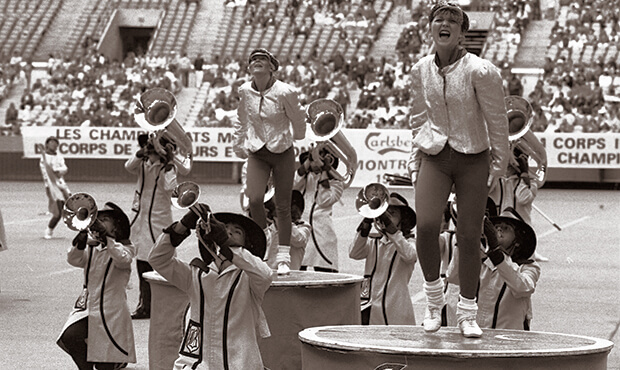 The 1982 DCI World Championships went back to Montreal for the second year in a row, with the Prelims competition once again held at McGill University's Molson Stadium and the Finals at Olympic Stadium, built for the 1976 Summer Games. Finals night was a cold one, a chilly 41 degrees Fahrenheit that left fans shivering in the cavernous arena. Bridgemen's eighth-place 1982 production started with the theme from "Shaft," the 1971 hit movie with Richard Roundtree in the title role as a hip, no-nonsense detective. The edgy soundtrack, radically featuring wah-wah guitar effects, won composer/performer Isaac Hayes two Grammy Awards and the Academy Award for Best Original Song. The song hit number one on the Billboard Hot 100 chart and in 2004, it was named the 28th greatest movie song of all time by the American Film Institute. Duke Ellington led his own big band from 1923 almost until his death in 1974. He came to prominence at the Cotton Club, a Harlem nightclub that from 1923 to 1940 introduced or featured many of the most famous black musicians of the day—This despite being a segregated music club for whites only. Bridgemen's "Sophisticated Ladies Medley" was extracted from the 1981 Broadway musical revue of the same name, which was based on Ellington's music. The first song in the medley was "Sophisticated Lady," a mellow 1932 jazz standard. An arc-shaped sign spelling out "Cotton Club" was set at the front of the football field as solo baritone and contra players introduced the theme. As the entire horn line came in on the melody, eight round tables painted with the logo of an apple with a bite taken out—a symbol of New York—were set up in the "club" on the field and the sign was turned upright to become the club's bar, with one of the color guard members serving as bartender. The medley transitioned to a rousing rendition of "It Don't Mean a Thing (If It Ain't Got That Swing)," with some horn players standing atop the tables. The second half of the tune witnessed eight color guard members gleefully swing dancing on the scenery. Next was a drum solo called "Black Market Juggler," based on "Black Market" and "The Juggler," two works written by Josef Zawinul for the jazz-fusion band, Weather Report. Zawinul, an Austrian jazz keyboardist, was one of the prominent exponents in the earlier days of electronic keyboards and a 1970 co-founder of Weather Report, one of the more successful experiments in jazz fusion, combining jazz, rock and world music. "Black Market" was the first song off the band's seventh album of 1976 of the same name. "The Juggler" came from the 1977 album, "Heavy Weather," the band's eighth record and their most successful, which also included Zawinul's hit, "Birdland." For the solo, the Bridgemen snare line came to the front of the field behind eight roto-toms set up and sequentially tuned to separate descending pitches. Roto-toms are shell-less drums built by Remo that are tuned by turning the frames to which the heads are attached. 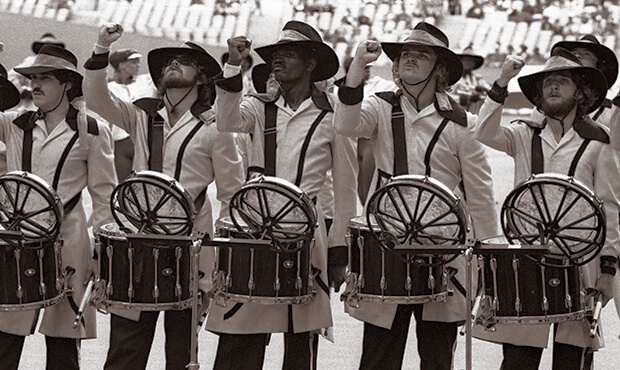 The snare drummers demonstrated their technical prowess by playing a continuous 16th-note pattern with their left hands while playing the roto-toms with their right. The closing "Broadway Medley" section of the Bridgemen production started with "On Broadway," a song written by Barry Mann and Cynthia Weil in 1963. The next song was "Lullaby of Broadway," written by Harry Warren and Al Dubin for the film musical, "Gold Diggers of 1935." It was recorded by several artists over the decades and achieved new popularity in the smash 1980 Broadway musical, "42nd Street." This was followed by "New York, New York," written by John Kander and Fred Ebb for Martin Scorcese's 1977 film of the same name. In the movie, the song was performed by Liza Minnelli, and the following year, Frank Sinatra started singing it. It's easy to confuse the title for another work of the same name, the Leonard Bernstein melody that was written for the 1944 Broadway musicial, "On the Town." That song has been played by a number of drum corps and its opening notes began Bridgemen's version. The horns, surrounded by flags, high-stepped toward the stands in a block triangle wedge while playing the grand chorus of the melody. During the last half-minute of the show, a color guard member came up to the podium and reclined upon it, casually eating an apple and referencing the design on the round tables. Upon concluding the show, with a full-corps statement of the four-note Bernstein theme, the entire corps fell backward onto the field, replicating the "fainting" act that caught the drum corps activity by surprise when the Brdgemen did it during the 1976 DCI World Championship Finals. For this week only, you can save on the Legacy Collection DVD that contains this complete Bridgemen performance, along with all finalists from the 1982 DCI World Championships. Discount DVD offer ends Monday, April 14.